Amy Lueking, Rod Young, and Wesley Nyberg at PEC. Butler Students Excel in Engineering Industry. From an early age, Rod Young – now the CEO and president of Professional Engineering Consultants (PEC) - dreamt of attending Kansas State University. He was ready to leave his home in Rose Hill and start wearing purple. Quickly, he realized the large impersonal classes were intimidating. He took a semester off, lived at home and attended Butler Community College. After becoming confident in calculus and engineering physics – and continuing to wear purple - Young was ready to head back to Manhattan. He believes community college is a great alternative to jumping straight into a four-year degree program. Because of his admiration for Butler, Young is always on the lookout for students who attend or have graduated from the community college. Throughout the years, PEC has offered dozens of internships to students from several colleges, including Butler. Amy Lueking started drafting at PEC in the mid-2000’s. She had moved to Wichita from Nebraska, worked in a daycare center, and at 25 wanted to start a new career. After two years at Butler, Lueking headed to Wichita State University and eventually graduated with a bachelor’s degree in mechanical engineering – all the while working at PEC. “I feel like I went into my Wichita State classes really well-prepared because I had such a good foundation at Butler,” Lueking said. Wesley Nyberg also works at PEC. A graduate of El Dorado High School, Nyberg was awarded the Hubbard Award – Butler’s highest scholarship, and then headed off to Kansas State University where he earned a bachelor’s and master’s degree in civil engineering. Young calls Lueking and Nyberg rock stars. He sends both of them out to Butler where they mentor pre-engineering students. Two of Young’s three children attended Butler and both PEC and the Young family have an endowed scholarship. He hopes to continue to mentor students from all colleges and help them succeed. From a personal point of view, as well as a business point of view, Young sees Butler as an asset for the community. 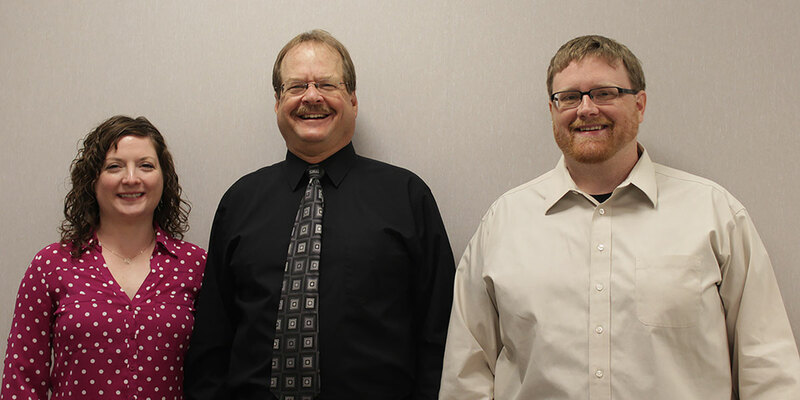 Pictured (L-R): Amy Lueking, Rod Young, and Wesley Nyberg at PEC.